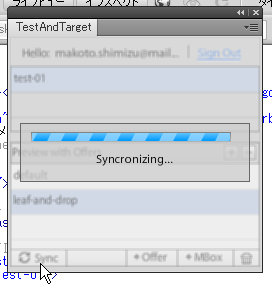 I was lucky enough to test pre-release version of Dreamweaver CS5 and Omniture TestAndTarget Extension. Below is the new workflow for creators to prepare assets for A/B testing. 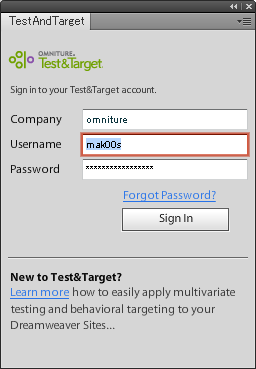 You can sign in to Test&Target directly from Dreamweaver using this new panel. First thing to do is to create a new MBox to test. Select the content area and click "+MBox" button. 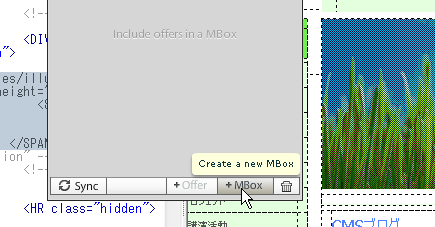 Now let's create another offer inside the MBox by clicking "+Offer" buton. If you click the name of the newly created offer, the design view gets updated. "Insert Content Here" is a dummy text. You can change it to any content you like. I changed it to a different photo. I can easily switch back to the default content with a single click. Click "Sync", and you're all set. It's that simple and fun. Go to Test&Target Website to edit Campaigns (Experiences) to set up A/B test. Basically the TestAndTarget Extension is for designers to create assets for A/B testing.